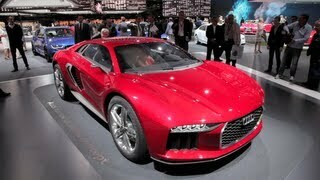 Audi has released the Audi nanuk Quattro concept show car, sportiness in a new form, at the 2013 Frankfurt Motor Show. This crossover concept combines the dynamics of a high-performance sports car with Audi's quattro expertise on the road and also combines the dynamics of a mid-engine sports car with the versatility of a sporty recreational vehicle. The Audi nanuk quattro concept is a dynamic sculpture on large wheels that opens a new chapter in the Audi design language. At the front of the show car is a very flat version of a hexagonal single-frame grille. A narrow aluminum frame encircles its insert. Dynamic daytime running lights also serve as dynamic turn signals. The interior of the Audi nanuk quattro concept has been reduced to the essentials. A carbon island accentuates the cockpit and provides for a clear driver focus. The instrument panel is supported by aluminum stirrups at the center console and there is also a holder made of a soft material in the scissor doors. The 2013 Audi nanuk quattro concept is powered by a newly developed 5.0-liter V10 TDI engine producing over 400 kW (544 hp) and delivers 1,000 Nm (737.56 lb-ft) of torque. Its twin-turbo register charging unit is controlled via the Audi valvelift system (AVS). A beefed-up seven-speed S tronic located behind the engine transfers the torque to a specially designed quattro drivetrain. 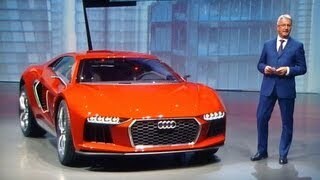 The Audi nanuk quattro concept has a curb weight of around 1,900 kilograms (4,188.78 lb). It sprints from 0 to 100 km/h (62.14 mph) in 3.8 seconds, and the top speed is 305 km/h (189.52 mph).